Last Tuesday night, legendary broadcaster Mike Lange was honored by the Penguins for his 40 years of calling Penguins games. This is perfect timing, because this serves as a distraction from the recent spotty play of the Penguins. (Have yinz heard about the cap problems and not being able to dress a full team for tonight?) Instead, I decided to go through YouTube and find some Mike Lange calls from classic Penguins games when the team was actually playing good hockey. 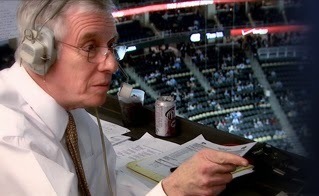 What are your favorite Mike Lange moments? Here are some of mine. 1) The Penguins win their first Stanley Cup against the Minnesota North Stars. 2) The Penguins win their second Stanley Cup and go back to back against the Chicago Blackhawks. 3) Mario Lemieux scores 5 goals against the Philadelphia Flyers in the Penguins' first playoff berth since Lemieux's arrival. 4) Mario Lemieux scores 5 goals against the New York Rangers as the Penguins set an NHL record 16th straight win. 5) Mario Lemieux returns from retirement against the Toronto Maple Leafs. 6) The Penguins beat the Washington Crapitals in a 4 overtime game on a goal by Petr Nedved. 7) Frank Pietrangelo makes "The Save" against the New Jersey Devils. 8) Game 7 of the Stanley Cup finals against the Detroit Red Wings and the Penguins win their third Stanley Cup.